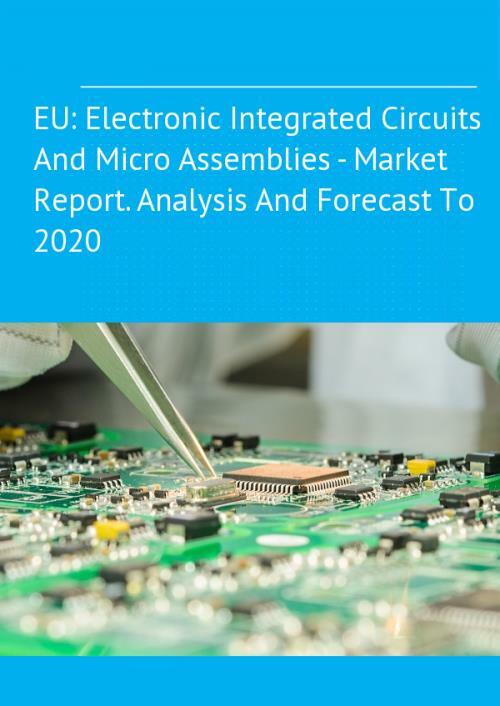 This report focuses on the EU electronic integrated circuit market, providing a comprehensive analysis and the most recent data on its market size and volume, EU trade, price dynamics, domestic production, and turnover in the industry. The market trends section reveals the main issues and uncertainties concerning the industry, while the medium-term outlook uncovers market prospects. The attractivity index (IB Index) summarizes the source of existing opportunities as they appear in this market, as well as an interpretation of the trade figures. EU(28) - Austria, Belgium, Bulgaria, the Czech Republic, Denmark, Germany, Estonia, Ireland, Greece, Spain, France, Croatia, Italy, Cyprus, Latvia, Lithuania, Luxembourg, Hungary, Malta, the Netherlands, Poland, Portugal, Romania, Slovenia, Slovakia, Finland, Sweden, the United Kingdom. Electronic integrated circuits: processers and controllers, whether or not combined with memories, converters, logic circuits, amplifiers, clock and timing circuits, or other circuits; memories, amplifiers or other. This report will provide you with deeper insights into current market developments with the latest data and underlying market affecting themes, allowing you to rewire your business around them.